Bathing elephants, shadowing mahouts and interacting with Thailand’s ethnic minorities – frame it just right, and it’s hard to believe you’re actually working. The elephant camp is roughly 40 miles (65 kilometers) outside of Chiang Mai city center, so you’ll be based in the back country five days of the week. This beats commuting to and from the volunteer house, but it’s the accommodation that will have you singing. Imagine waking up in a furnished tree house overhanging the river. Makes you wonder why more of us don’t move in with the elephants. Morning comes early at this working elephant camp, and the animals need to be fed and bathed before the day visitors start pouring in. Bath time is in the river, and it’s pure joy for elephants. Their mahouts are a fun-loving lot, and they’ll see to it that you have as much fun as the elephants do. Just don’t expect to win any water fights – those trunks double as powerful watering hoses. 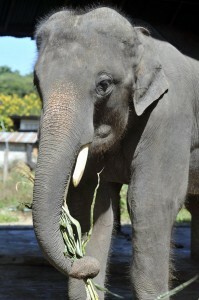 Breakfast for the elephants is corn and grass that you’ll help cut. Elephants easily weigh three to four tons (sometimes more), and they eat around 300 pounds (136 kilograms) of food every day. With that in mind, it takes them a while to fill their bellies; so you’ll have time to look after your own needs. The kitchen staff will have a cup of Northern Thai coffee or tea ready for you, and they’ll also serve you a made-to-order breakfast. Your duties will vary during the afternoon. The staff may need help moving equipment or tending to one of the camp’s baby elephants. Each elephant is looked after by a specific mahout, and you may be approached on an individual basis to help with training. In any event, the late afternoon and evening is when you’ll have the opportunity to bond with the elephants and get to know their trainers. Elephants have been domesticated in Asia for thousands of years, but these days they’re suffering from something of an unemployment problem. Since the reform of the timber industry and the advent of four-wheel drive, it’s been harder finding jobs for them. Wild populations still roam a few of Thailand’s national forests, but to keep numbers up, Thais have had to find new roles for their national emblem. That’s where the elephant camp comes in. The camp has been in business for 20 years and maintains a roster of 70 elephants and 250 employees. Tourists visit on a daily basis to interact with the elephants and watch demonstrations, and the revenue generated directly funds the care of the elephants and upkeep of the facilities. As an active member of this community, you make it that much easier for the mahouts and staff to perform their daily duties. Beyond this, the village around the camp is home to the mahouts and their families, most of whom hail from ethnic minority villages in the countryside. There are all kinds of ways you can help out on this front, not least by teaching English in the local school. This is a spectacular way to vary your daily routine, and it adds an enriching human element to your jungle experience. 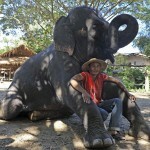 The minimum age of participation in the Elephant Camp Volunteer Project is 18. Volunteers do not need any specific qualifications, but should be able-bodied, enjoy working outside and with animals. As in any cross-cultural context, those involved are asked to be flexible and be open to other customs and traditions. Participation in the Elephant Camp Volunteer Project starts at $1349 for two weeks. Each additional week is $329. Airport pick up, accommodation during orientation and throughout entire project duration all meals while at the Elephant Camp, Transportation to and from Chiang Mai and the Elephant Camp, 2 day orientation, half day city tour, cultural dinner and show, onsite coordinator and 24 hour emergency assistance. Plane tickets, travel insurance, ride to the airport after service, meals on Saturdays and Sundays.